When I first moved to NYC I remember that the feeling of true independence was, well, terrifying at times. And it was never scarier then when I had done something really really stupid and had been lucky. I can clearly remember thinking to myself, "Who is watching me? I'm going to kill or maim myself or others." That's right after years of taking care of myself, I still occasionally do things that could burn the whole apartment building down. Last night I turned the kettle on for tea, but you guessed it, turned on the wrong burner. 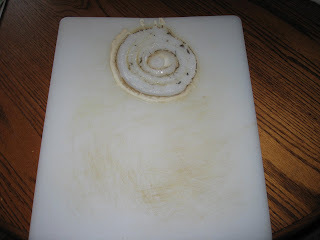 Sitting on the burner I turned on was this plastic cutting board. Well, before the smoke alarms even went off...but not much before the house was filled with a vile smoke, I check on the water to find a cutting board on fire. I hate my electric stove (preferring gas) but was grateful for it last night. Open flame could have made for complete disaster. I can not believe I was this stupid, thank goodness I'm lucky! Please no scoldings in the comments - I am ashamed enough. oh it will get worse. Try boiling pacifiers to sterilize them and realizing when you smell that awful plastic burning smell that you forgot to put water in the pot. and I'm in charge of other people...ack! Ashamed? Come on. Remember who almost set his apartment on fire with a grill on the fire escape? This is kid stuff compared to that.